A US jet has shot down an Iranian-made drone operated by forces backing the Syrian government in the south of the country, American officials say. The drone was thought to be armed and threatening US-led coalition troops on the ground, officials said. This is the latest incident in the skies over Syria, after the US shot down a Syrian fighter plane on Sunday and another drone earlier this month. 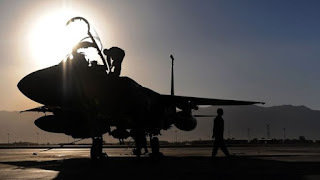 The F-15 plane downed the drone around 00:30 on Tuesday (21:30 GMT Monday) north-east of Tanf, according to a US military statement. The incident underscores the growing tensions in the region as a battle develops for the control of eastern Syria, BBC defence and diplomatic correspondent Jonathan Marcus says. In another development, the US military announced officially that coalition forces had killed the top cleric of so-called Islamic State (IS), Turki al-Binali, in an air strike in Syria last month. IS supporters have also reported his death.